If you follow us on Instagram, you know that we went to put up our Christmas tree this year and realized we didn't like any of our ornaments. Or maybe it was that none of them went together and we wanted to have a more cohesive tree. Wait, side note.... do you prefer white or multi-color lights? This is always a debate for our tree, but we always just end up using both. So we wanted our tree to go along with that. Casey found a waffle ornament (and she LOVES waffles) and then we found a french fry ornament (and i LOVE those) so we just decided to go with the kitschy colorful tree. I think my favorite ornament though is the jigsaw one that Casey found. How perfect?! Anyway...what's the perfect kitschy tree topper to go along with all of this? 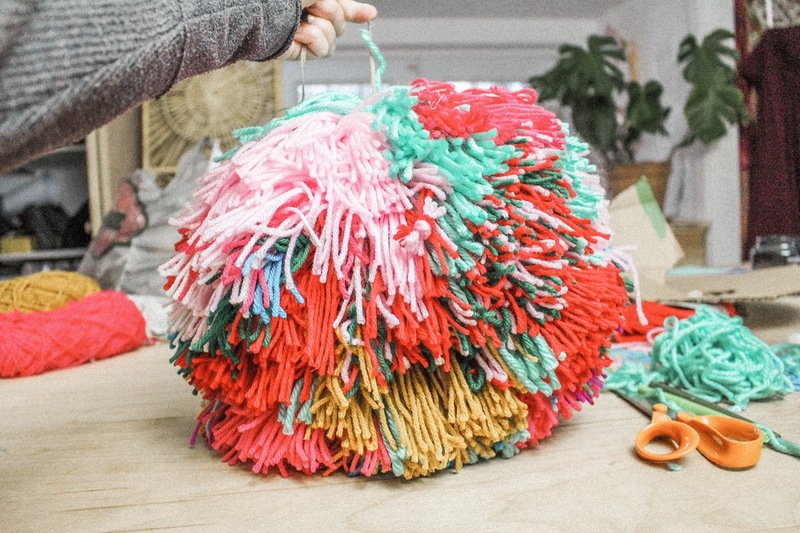 A giant colorful pom pom. 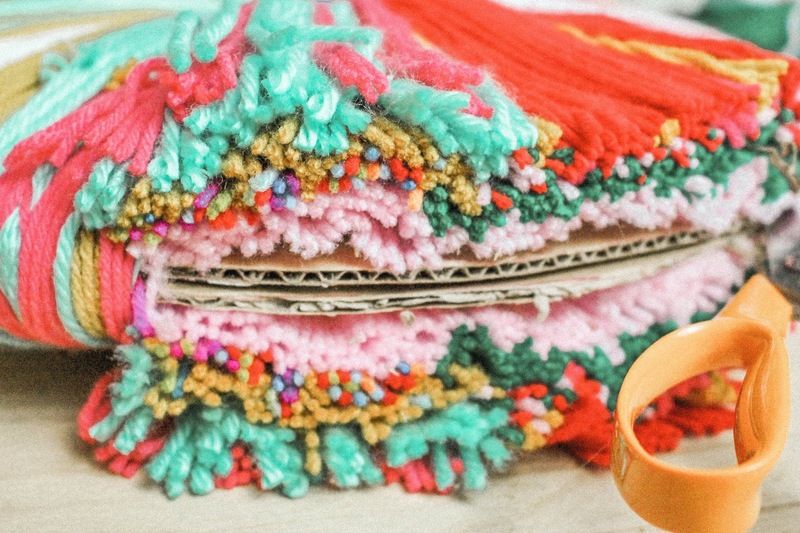 You may have made pom poms before, and the method for this is no different. 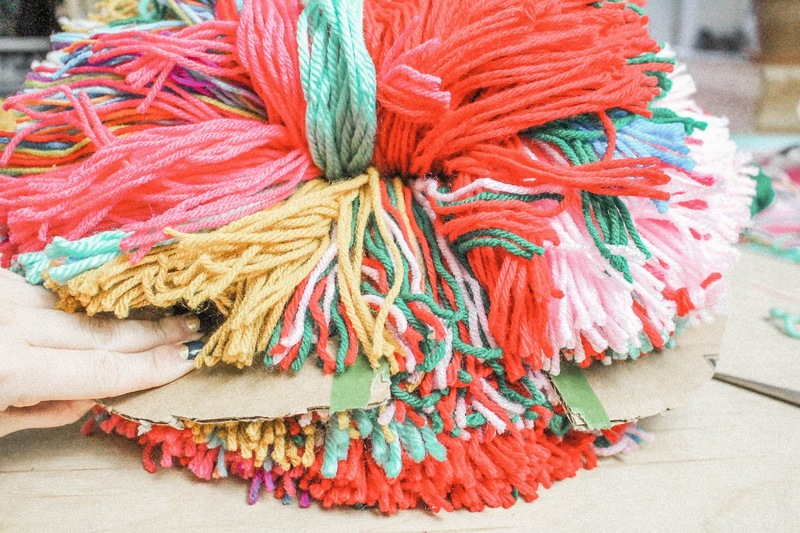 The only thing is that you won't be able to find pom pom makers big enough to make this one. 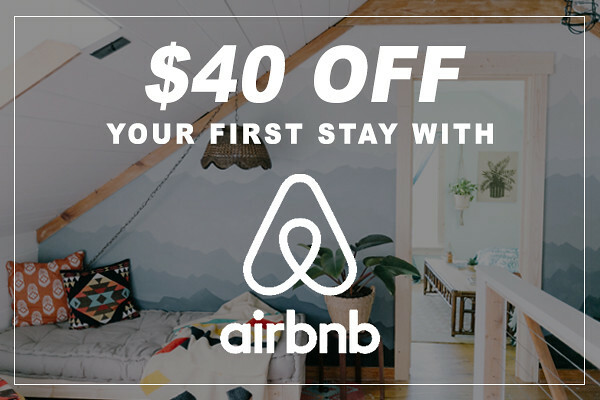 So we are going to show you just how to make it. 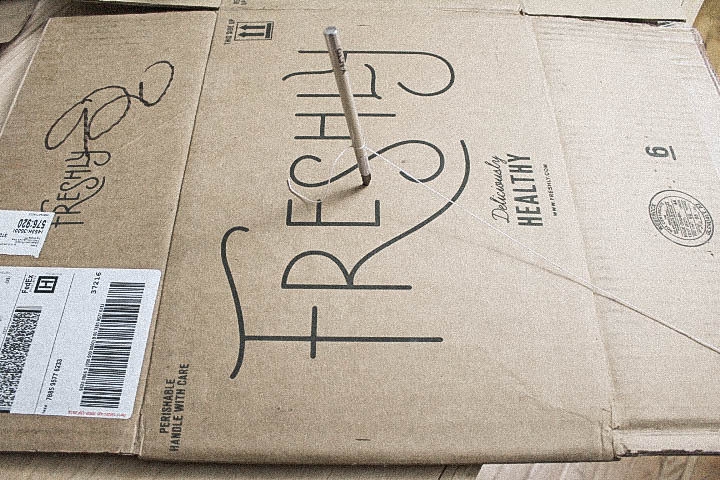 To start out, stick your Xacto knife in the middle of your cardboard and tie a string to it. Measure 12 inches away from the X-acto knife on the string and wrap the string around a pencil or marker. Draw a circle using the tension of the string. Do the same 2 inches away from the center. 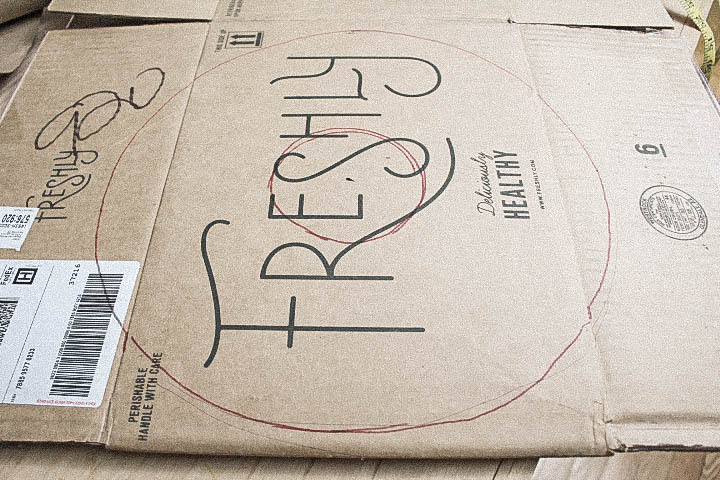 Cut out both circles with and X-acto knife and trace it onto another piece of cardboard and cut it out too. 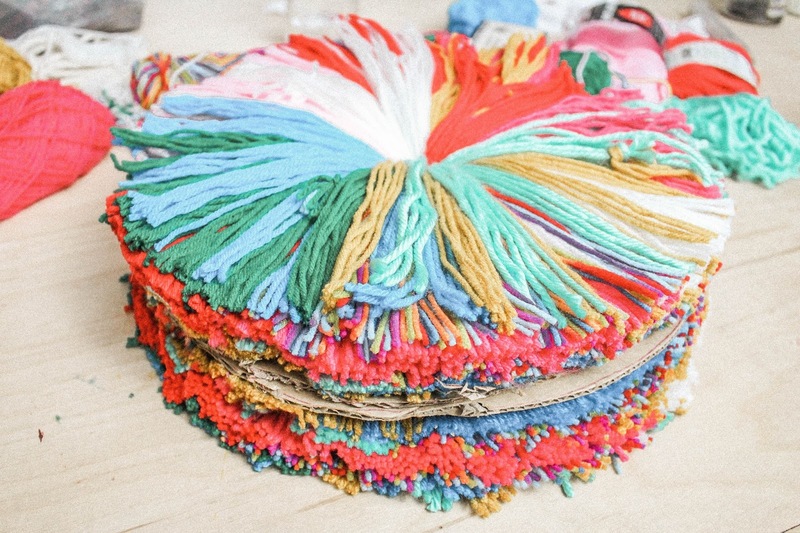 Stack the pieces on top of each other and start wrapping yarn around the cardboard from the inside circle to the outside circle. This is the part that requires much of your patience. It's tedious and great for something to do while watching TV. 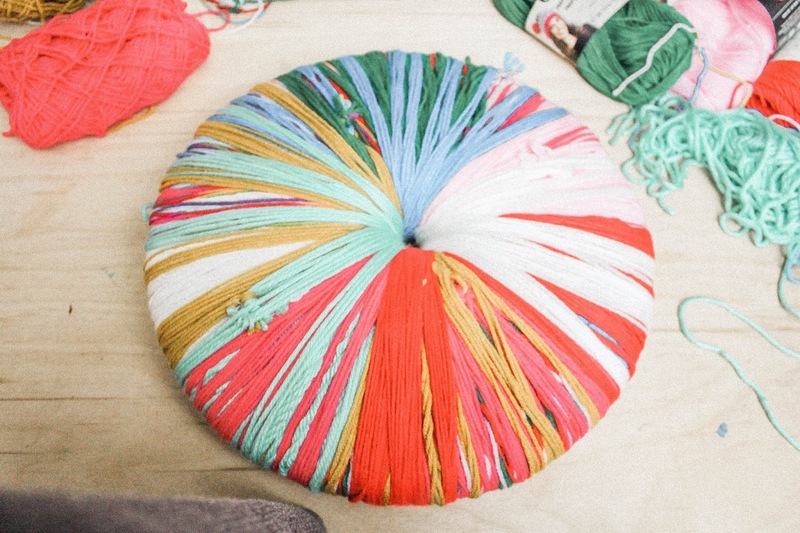 What made it easier for me was to cut enough yarn to roll up into a ball that would fit through the middle hole. I also doubled, tripled and sometimes quadrupled the yarn when wrapping it around so it took less time. 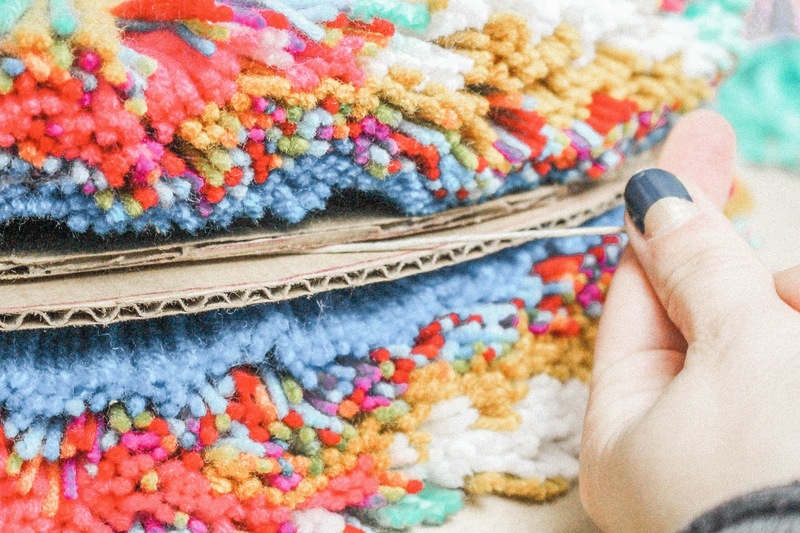 You could definitely use fatter yarn to make this process go by fast. That would also make it less shaggy if that's the route you are going for! I alternated colors so I would just tie the ends together when it was time to switch. 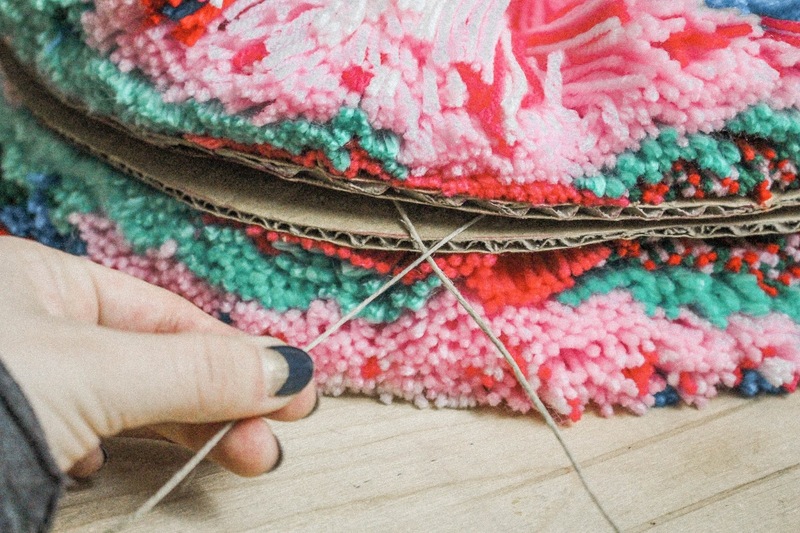 The goal is to wrap the yarn around over and over again until it completely fills the hole up. 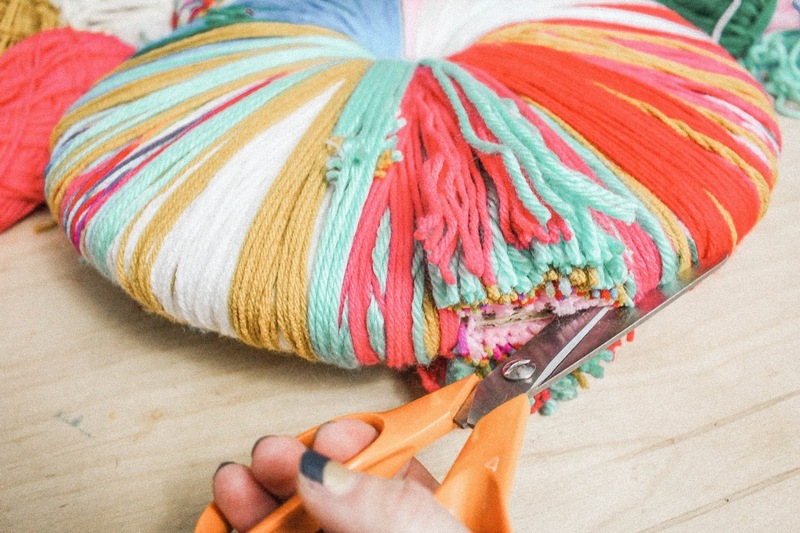 Another way to create less of a shaggy pom pom is to make the center hole larger. 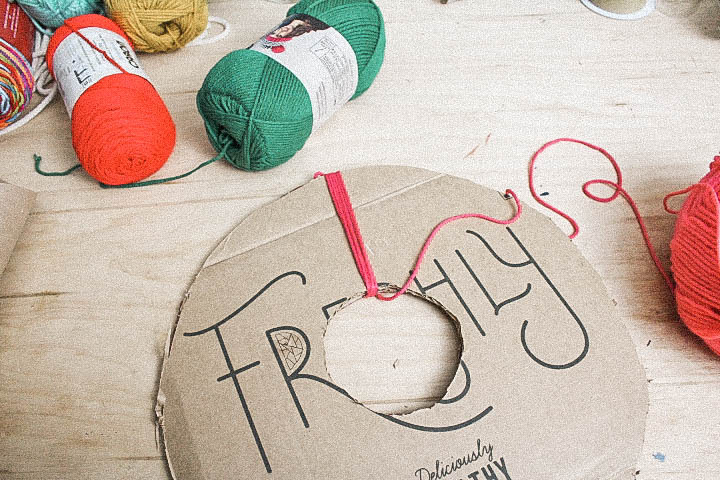 Once you have filled the hole up, cut through all of then yarn around the cardboard circle. I put the scissors between the two layers as a guide. Make sure not to move the yarn once it is cut. You should have a massive thing that looks something like this. 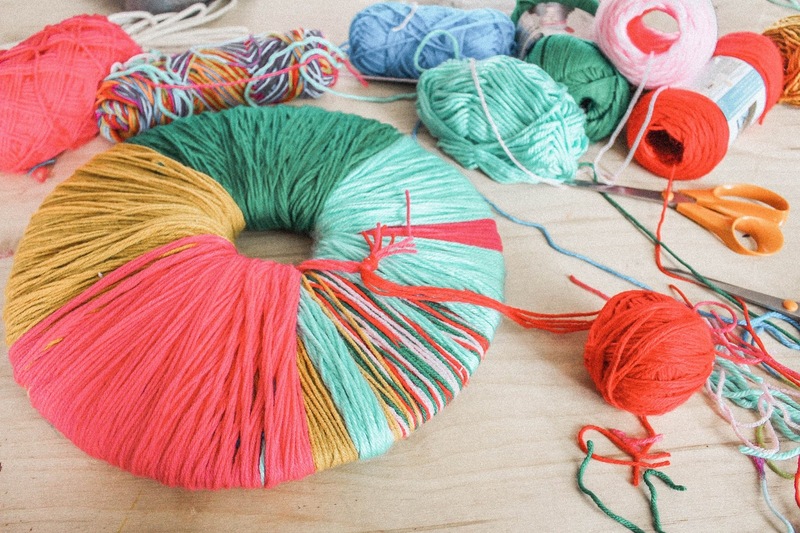 Take a long piece of string and wrap it around the center of the yarn by placing it in between the two pieces of cardboard and pull it really tight before tying a knot. 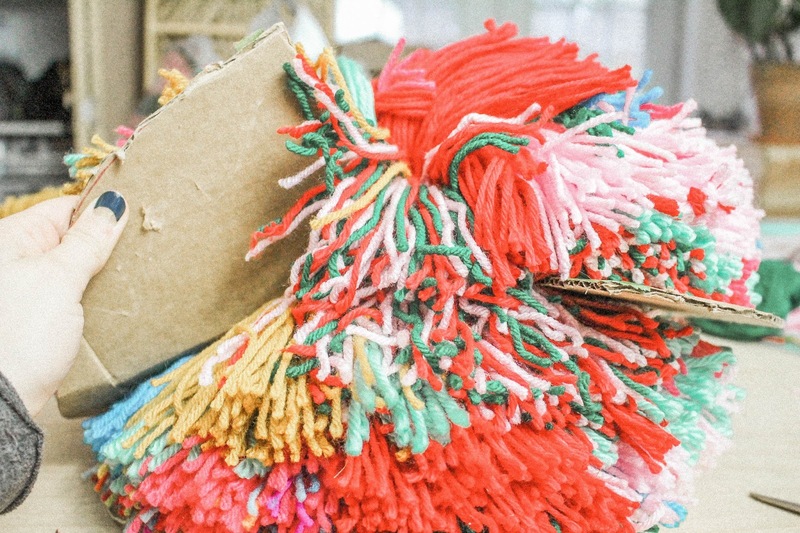 And then you have to finagle the ball of yarn out of the cardboard. 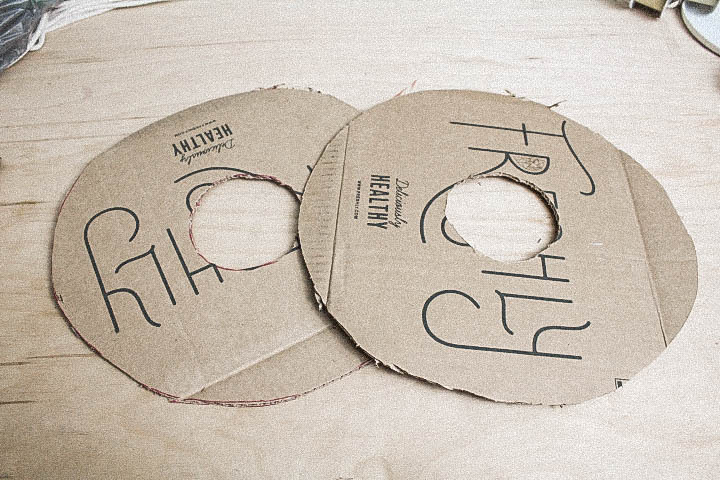 I ended up cutting the cardboard towards the middle because I couldn't pull the yarn out of the middle hole. And then you have something that resembles this. I ended up trimming a lot of the excess off and shaping the ball into a sphere. I left it a little shaggy though to keep a more vintage vibe. Now setting this up on the top of tree is actually more of a balancing act. 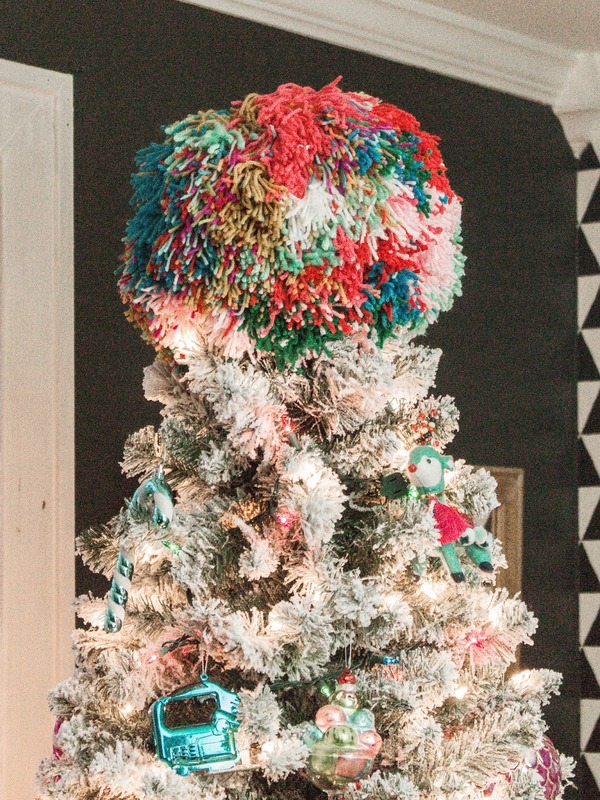 You could get some long twist ties and attach them to the pom pom and the tree, but all I did was bend up the top pieces (yes, we have a fake tree) into Y shapes so the pom pom could balance perfectly in the middle. Works like a charm if you don't move the tree around! 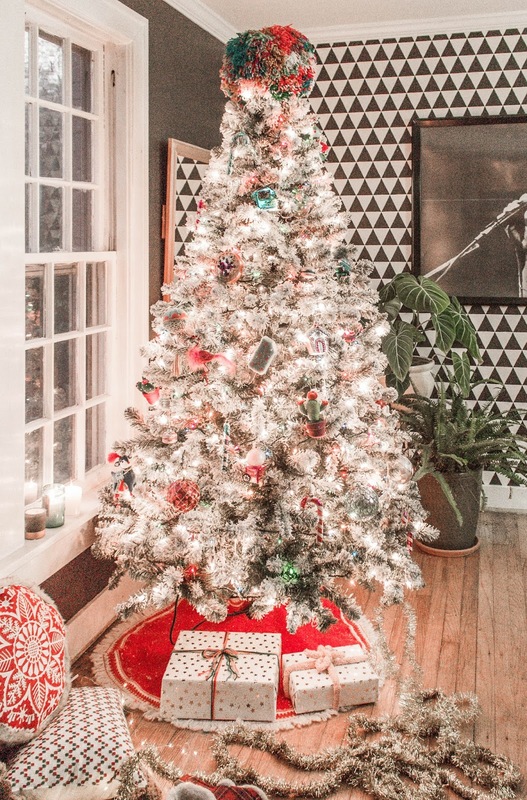 Anyway, if you have the patience to do this project, it will really add some color and texture to your tree. 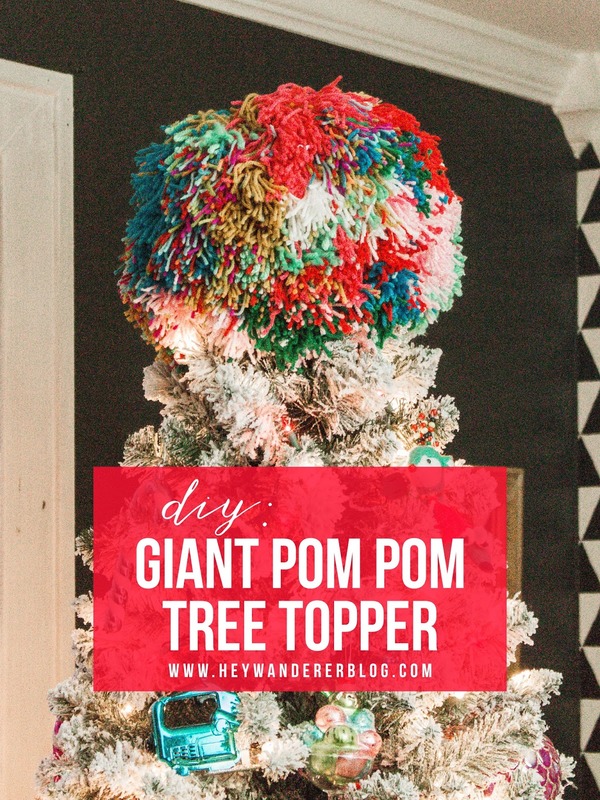 You could also use the pom pom as a party decoration that doesn't involve Christmas. The possibilities are endless! If you liked this tutorial and would like to see more like this, pin the image below!